I can’t believe I missed this one earlier this year especially since a friend of mine is one of the authors…BUT this is an important one for the industry showing that not only did adherence improve moving from retail to mail order pharmacy but as pharmacy costs when up the corresponding medical costs went down MORE! Objective: To compare long-term diabetes medication adherence and healthcare costs in patients using mail order pharmacy versus retail pharmacy. Methods: The MarketScan database was used to identify patients who filled prescriptions for oral anti-diabetes medications in a retail pharmacy for at least 6 months before switching to mail order pharmacy for at least 12 months. These patients were matched to others who used retail pharmacy continuously for at least 18 months. A propensity score was used to create matched groups of patients comparable on probability of switching to mail order, weighted Poisson regression was used to analyze differences in medication adherence, and Tobit regression was used to compare costs. Results: A total of 14,600 patients who switched to mail order were matched to 43,800 patients who used retail pharmacy continuously. 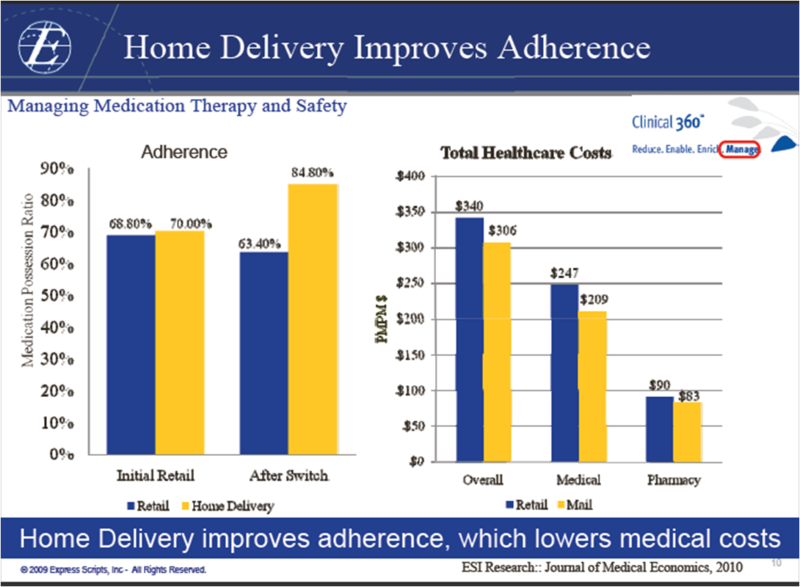 The average adjusted adherence in retail pharmacy was 63.4% compared to 84.8% after switching to mail order. Per-member-per-month total healthcare and total medical costs were on average $34.32 and $37.54 lower in the mail order group, respectively. Diabetes-related medical costs were on average $19.14 lower in the mail order group, while pharmacy costs were $14.13 higher. Limitations: Limitations include a patient population under the age of 65, no information on pharmacy benefit design, and limited follow-up time relative to that necessary to identify long-term diabetes complications. Conclusions: After adjusting for measured confounders of medication adherence and disease severity, individuals who switched to mail order pharmacy had higher medication possession ratios and trended toward lower total and diabetes-related medical costs over time. Press release about it here.